I don't think I've ever taken the time to appreciate a bowl of Strawberry ice cream. I mean, I've had it a million times as a kid, but I was either covering it in chocolate sauce or smushing it with chocolate ice cream to make a tangy chocolately treat. Now, let's be honest, I don't plan on doing a lot of appreciating. As much as I enjoyed the fresh strawberry taste or the great texture of Breyers Strawberry Ice Cream, I don't think I could eat it all the time. It's another well made Breyers flavor, I just don't rush to the freezer for it. It reminds me of that great cool whip & strawberry frosting you can make and put on fresh angel food cake. Mmmmmm. Doh! Now I want some angel food cake. So good job Breyers, I'm glad to see this is just as tasty as it was 20 years ago. 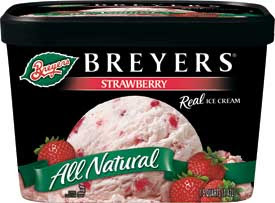 Strawberry is such a classic flavor of ice cream and Breyer does it well. I like how they have the real strawberry pieces rather than just an unnaturally bright pink color and artificial flavorings, that other brands have.